Everytime a person leaves the outside world and enters your business you have the power to make an impression on them. What that person experiences when they walk through your front doors is a significant touchpoint, one that can have major influence on how they feel about your company. Retailers make serious investments to elevate people’s mood in this “transition/decompression zone“. Here, we’ll explain how you can make a better initial impact with a budget of just €1 a day. That’s right, a mere €1 a day can be the difference between a great start or a lost opportunity. It sounds insignificant, but €1 invested in the right details can yield dramatic returns. You’d be surprised at the effect that one strategically-located plant can have on people’s attitudes towards you. A flowering plant has a particular power to make you feel welcome when you walk into a workplace. Especially when the transition zone is an empty lobby/holding area where there is no receptionist to greet you. Placed on a reception desk, flowers accentuate the warmth of your receptionist’s greeting. This ability to lift people’s spirits the moment they enter your building is what makes a plant pay dividends. Fresh flowers are the ultimate welcoming device. For a short time they will repay you handsomely, projecting positivity, vigour and vitality. Keeping them looking their best can be tricky, though. Sooner or later your returns will diminish as they start to wilt. If you have the budget and time to keep monitoring, reordering and primping fresh flowers then great. If not, that doesn’t mean you have to give up on making a better first impression. Artificial flowers have a similar ability to engender goodwill, with the added advantages of saving you hassle and money. The plant in our cover photo? That’s an orchid, from our artificial silk flowers range. A fresh cut orchid might give you around 1-month’s worth of positive impressions. This lifelike alternative will create an infinite number. 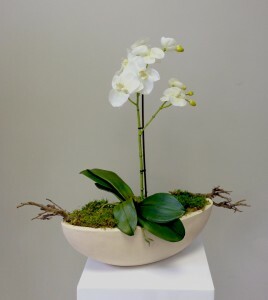 For a once-off outlay of just €200 you get the orchid, plus the preserved moss and branch flourishes plus the stylish boat planter. All in. All this impact can be yours for less than €1 per business day*. €1. It’s probably not the figure that came to mind when we asked you to put a value on creating a Great First Impression. But that’s the magic of plants and flowers – their appeal can be priceless. An attractive orchid arrangement: A small detail in the big scheme of things, but it can be just what your business needs to uplift staff and incline visitors to see you in a favourable light everytime they enter your building. Mummie Plants Orchids are made-to-order and can be adapted to your unique specifications. For more call Norma on 01 296 4540.